As part of de Souza Institute’s 10th Anniversary, we are introducing the Expert Insights series. This free video series reaffirms our commitment to knowledge sharing and professional development. 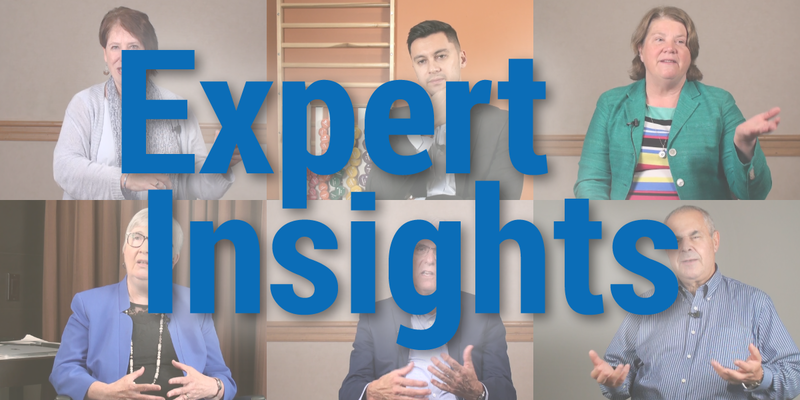 The Expert Insights series is a collection of short, informative and practical videos where speakers share their thoughts on emerging health care trends. The focus is on specialized topics of interest in cancer and palliative care, where we aim to inspire health care professionals to lead and create change for the future of health care. Some changes, as a result of cancer, may irreversibly affect patients’ quality of life. Dr. Gerald Devins, Professor of Psychiatry, University of Toronto, discusses the concept of illness intrusiveness and provides some strategies to mitigate emotional distress, as well as preserve and enhance the quality of life. Surviving cancer is not the end of a patient’s journey but more of a start of the survivorship phase. Dr. Janine Giese-Davis is an Associate Professor at the University of Calgary with expertise in survivorship research. In this Experts Insights video, Janine outlines some of the common survivorship challenges patients face as well as the interventions available to confront and overcome these challenges. What role does decision-making play in cancer prevention? Dr. Zeev Rosberger is a senior investigator for medical research as well as an Associate Professor of Medicine and Psychology. In this video, he talks about his research on people’s knowledge base, attitudes, and concerns about the HPV vaccine. How do people navigate their way through facts or myths? Understanding how individuals make decisions helps healthcare providers deliver the right information at the right time. How can we improve psychosocial oncology care for patients affected by cancer? In this installment of the Expert Insight series, Dr. Deborah McLeod speaks to the role continuing education plays in responding to the increasing demands of expertise in psychosocial oncology. Various programs are discussed on how healthcare practitioners can boost their confidence and knowledge in dealing with the emotional aspects of patients and families affected by cancer. Does screening for distress actually improve patient outcomes? Tune in and listen to Dr. Barry Bultz a leading voice in psychosocial oncology as he discusses the importance of distress screening. Dr. Bultz outlines how we can use distress screening to increase communication between patients and healthcare providers, better understand exactly what the patient is experiencing and effectively deal with the symptoms revealed through the distress screening. Follow Dr. Daniel Santa Mina as he tells us about the concept of “prehabilitation”. Dr. Santa Mina conducts research to understand the relationship between exercise and oncology cancer treatment. He has identified a window of opportunity pre-treatment where patients are still able to exercise to prepare for the physical challenges of surgeries. Listen as he talks about the importance of the adaptability and creativity needed to design exercise routines that are flexible to various levels of pain and fatigue that the patient may be experiencing. Cancer affects both the patient and their partner in a significant way. Professor Wendy Duggleby talks about the needs of male caregivers and how roles and relationships transform when a female spouse is diagnosed with cancer. Professor Duggleby describes an online resource that she helped develop that is available for men to support their partners with cancer.